Does your furry family member need friends? 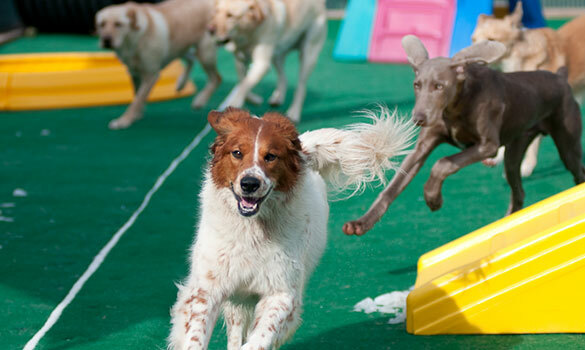 Our daycare facility is ideal for the social pooch on the go. Daycare is a great way to make sure your pet gets the affection, attention, and exercise that he or she needs during the day. We also offer a great opportunity to socialize your pet and teach them how to behave around others. We provide each pet with his or her own personal indoor suite (for naptime), blankets, toys, and treats. Larger suites are available for multiple pets. We have large play yards, complete with ForeverLawn K9 Grass, covered areas, playground equipment, lots of toys, and a pool in the summertime. Playgroups are always size appropriate. So, if you are looking for a place for your pet to burn off some energy or your dog is shy and needs to gain confidence, just give us a call and we can set up an appointment! If your pet has any special needs, just ask! Whether it's preparing a personalized diet, administering medications, or giving your pet a bath before heading home, we can do it! You may drop off and pick up your pet between the hours of 5:00am and 9:00pm, 7 days a week if you have purchased a daycare package. You must have an appointment prior to drop off. Please be respectful of the people living here. You will be given a code to let you into the daycare once you purchase a package; please do not give it to other people. Your pet will be evaluated the first few days they are here; if there are any problems we will notify you. If your pet needs to be fed, please make a note on the daily sign in sheet. The number to the left of your pet's name on the daily sign in sheet is their suite for the day. Please place your pet in his or her marked suite and remove any type of collar. If there is no marked suite, place them in an empty suite. Please check the number on the right side of the daily sign in sheet, that number is how many package days your pet has left not including that day. To purchase another package or pay for extra services, please use the drop box or pay at the main office during business hours. Current shot records are required. Just like children in school, it is possible for the pets to fight. Most of the time it is just a scratch or a puncture, but it could require stitches. Please make sure we have your updated contact numbers on file. If your pet needs to stay overnight please contact the front office before 4pm. If you see something that does not look right, please call (360) 561-2920.